Installing the plumbing system for a new home involves working with builders during each phase of construction. That’s why before jumping into plumbing a new home, it’s important to follow the building codes of your neighborhood and/or city. A local Vancouver, Camas, or Washougal plumber will ensure that your home is plumbed correctly and passes a city home inspection with flying colors. Plumbing a new home is an integral part of the construction process. The timeline for installing some plumbing features can depend what the home builders are working on, as some plumbing tasks can only be completed during specific phases of construction. 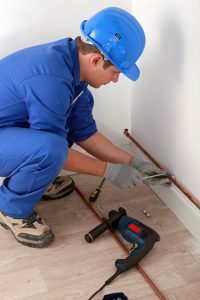 The first step for any plumber when installing the plumbing system for a new home is to get a connection to the municipal water supply. The main water line links the city’s water supply to homes so that occupants have running water. Using simple pipes, fittings and valves, a Vancouver plumber can connect to the main water line with relative ease. The drain-waste-system may not sound like much, but it’s arguably the most critical feature of your home’s internal plumbing system. A DWV system works exactly as it sounds, removing waste and sewage from the most-used fixtures of any living space: toilets, showers and sinks. In addition, the ventilation process in a DWV system ensures sewage gases are cleared from the home. Once the water line connection is made and the DWV system installed, it’s time to head for the bathroom and kitchen. Bathrooms have two major systems: One that brings clean water in, and one that moves waste out. On the other hand, kitchens generally rely on one large sink that handles an array of waste materials. Unfortunately, this set-up makes clogged sinks the most common cause of plumbing problems in the kitchen. An effective way to avoid major clogs is to install a garbage disposal during this phase of the home building process. Simpson Plumbing is proud to have served the Vancouver metro area for over 30 years. From plumbing repairs and maintenance to water heater installation and remodeling projects, our experienced plumbers can help you with just about any service you need. Contact us to speak with a qualified plumbing technician today.